Optimal hunting practices were investigated through hunting experiments carried out in Nesset and Skogn, important staging and hunting areas in Nord-Trøndelag. Researchers worked closely with hunting teams and guided the organization of hunting in the Nesset area and partially controlled hunting in the Skogn area from 2011-2013. The spatial and temporal organization of hunting was experimentally changed between years to represent a range of hunting practices. Responses to different hunting practices were measured by goose abundance and their distribution via daily observations during the hunting season. Additionally, researchers had access to information on hunting date, location, numbers of geese shot and number of shot used, provided by hunting teams. To provide guidance for the organization of hunting at a regional level, a species distribution model was constructed relating the presence of geese to a range of environmental variables, hypothesised to affect their landscape selection. Established relationships at local area levels where then used to model, predict and identify areas that had a high probability of geese occurring across the entire Nord-Trøndelag region. Furthermore, to determine whether food availability was a limiting factor for goose presence and numbers, the status of fields was classified and density of waste grain was counted on stubble fields before, during and after the geese had left experimental areas. Separating hunting events by approximately three days. Hunters placing themselves as close as possible to the location of geese flocks observed the day before a hunt. Coordinating their hunting with neighbouring hunters, staying approximately three km apart if shooting on the same day. The species distribution model can be used by hunters to identify areas throughout Nord-Trøndelag with the highest probability of geese occurring and predict the shortest return times by geese in response to hunting events. In this way use of the model by hunters can potentially increase hunting bags. For all observed years during these studies grain still remained in the fields when the geese had left the study areas. It is concluded that food resources were not a limiting factor at these stopover sites; furthermore, weather conditions (snow) were not limiting goose usage of these sites during the main autumn stopover season. 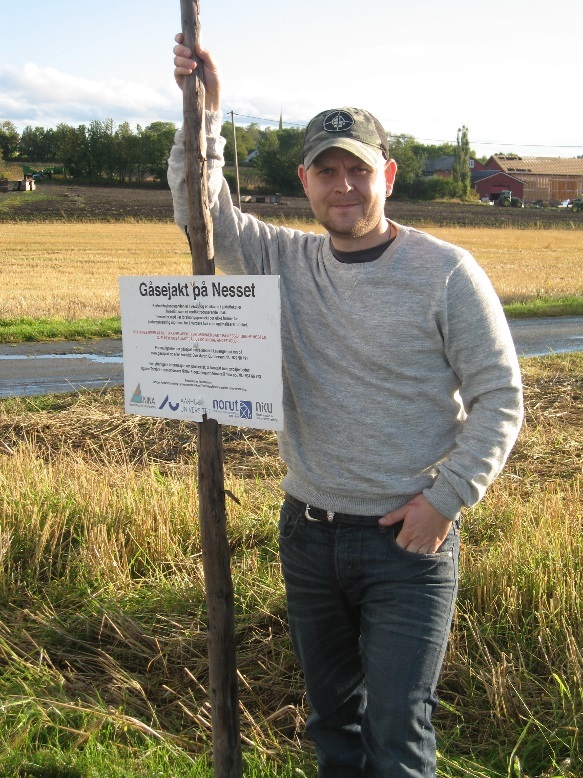 This research suggests that the Nord-Trøndelag area can accommodate more geese than currently observed and could support a higher level of harvest, if hunting is organised in such a way to reduce levels of disturbance. The research team are grateful to hunters and landowners in Nesset and Skogn for their participation in these research projects and their valuable contribution to the management of the population of pink-footed geese as part of the International Species Management Plan. These studies are described in three papers published in Wildlife Biology and are available on-line. Jensen, G.H., Tombre, I.M. & Madsen, J.2016. Environmental factors affecting numbers of pink-footed geese Anser brachyrhynchus utilising an autumn stopover site. Wildlife Biology 22:183-193. Jensen, G.H., Pellisier, L., Tombre, I.M. & Madsen, J. 2016. Landscape selection by migratory geese: implications for hunting organisation. Wildlife Biology, in press.